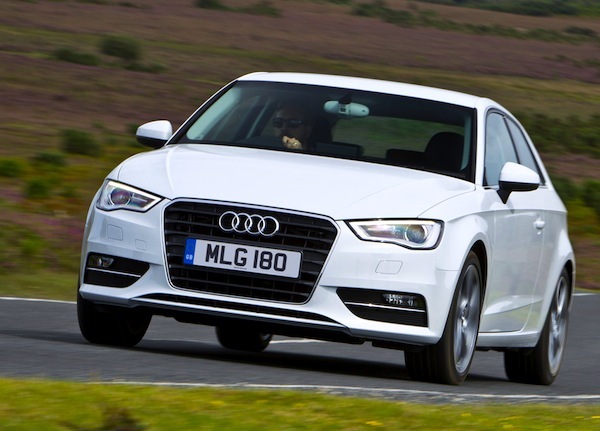 The Audi A3 is up to a record 7th place in England in 2014. Thanks to SMMT, I can share with you a Full Year report for England for the second time on BSCB. New car sales in England are up a splendid 10% year-on-year in 2014 to 2,099,401 registrations, slightly outperforming the UK market as a whole (+9%). One thing to keep in mind when approaching the English market is that most UK company leasing and rental car purchases are centralised here, which makes the English sales charts a little removed from what ‘real’ consumers buy compared to UK’s other nations. Given England represents 85% of the overall UK market and therefore the best-sellers are extremely similar to the UK ranking I described earlier. Case in point: the entire Top 6 is identical to the UK ranking with the Ford Fiesta, Focus, Vauxhall Corsa, VW Golf, Vauxhall Astra and Nissan Qashqai leading the way. The Audi A3 is up one spot on its UK ranking to #7 while thanks to strong December sales, the BMW 3 Series manage to keep the Nissan Juke out of the Top 10 unlike in the UK. Full Year 2014 Top 10 models Ranking Table vs. Full 2013 figures below. Full December 2014 Top 10 models Ranking Table below.